In the autumn of 2014, a company selling Hungarian residency bonds received the application of three Syrian nationals: Syrian president Bashar al-Assad’s moneyman, Atiya Khoury, wanted to get a residence permit for himself and his two children through Hungary’s controversial Golden Visa program. Their application included not a Syrian, but a Russian address. Their application was thus handled by VolDan, a company that was authorized to sell residency bonds in Russia, confidential documents and e-mails obtained by Direkt36 reveal. These documents also proved earlier that people close Árpád Habony, Hungarian PM Viktor Orbán’s top advisor, were involved in the operations of VolDan. The law creating the Hungarian residency bond program, initiated by Antal Rogán, a powerful politician of the governing Fidesz party and Árpád Habony’s long-time ally, was rushed through Parliament without substantial debate in 2012 and quickly became one of the most controversial initiatives of the Fidesz government. Under the scheme that ran between 2013 and 2017, those who invested 250-300 thousand euros in Hungarian state bonds were granted a Hungarian residence permit. Almost 20 thousand foreigners received such papers under the program. According to Hungarian authorities, potential bond investors were subject to a strict security screening. However, a joint investigation by Direkt36 and 444 has revealed that people who could pose serious security risks for Hungary and the European Union were also granted residency through the programme. One of them was Atiya Khoury, who was put on the sanction list by the United States’ Treasury Department for assisting Syrian president Bashar al-Assad’s regime in 2016. The sanction documents indicate that Khoury moves cash between Syria, Lebanon and Russia and he is responsible for human rights violations. The European Union also introduced sanctions against the Syrian’s regime, but Khoury was not put on the EU sanction list. 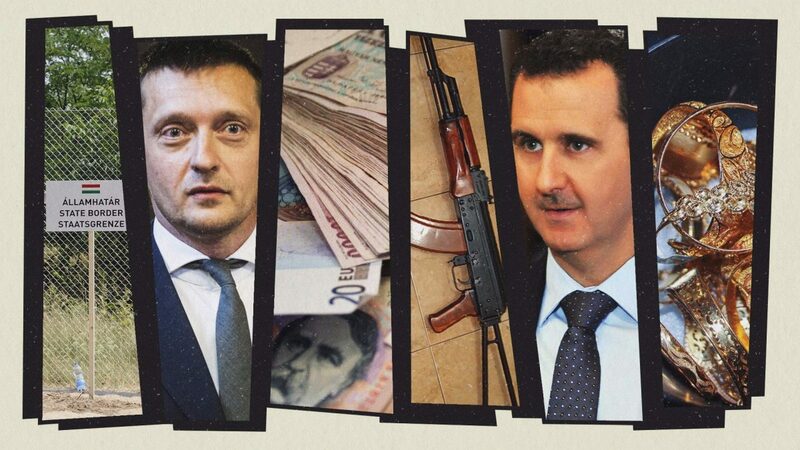 In the last months of 2014, it only took ten days – four working days – for the Syrian dictator’s moneyman to pass the security screening and to get Hungarian residence permit. His application was handled by two residency bond firms. First, Khoury’s application was received by S&Z Program Limited, a company that was authorized by the Economic Committee of the Hungarian Parliament to sell residency bonds in Syria. The company’s license was revoked on 25th September 2014, but S&Z’s program leader took care of Khoury’s application after that date: she forwarded the family’s application to another bond company, VolDan. This company mainly handles the applications of Russian clients, but it was also authorized to sell bonds to the citizens of other countries who submitted their application in Russia. S&Z’s program leader forwarded a Russian address together with Khoury’s application to VolDan, asking the company’s employees to prepare the contract and to send it to Khoury as soon as possible. The address sent with Khoury’s application is in South Moscow, on the 5th floor of an office building. An organization called RUSSAR is also registered on the same floor. According to its website, RUSSAR is a charity foundation created in 2014 “in response to the tragic events in Syria,” in order to provide humanitarian assistance to the people suffering from the Syrian civil war since 2011. In 2015, Russian forces have joined the increasingly complicated and bloody armed conflict, supporting Assad. Both Atiya and Mudalal use different variations of their surnames, such as Khuri and Khoury. The sanction documents do not indicate whether they are relatives, but the files note that they had common business deals: they coordinated together financial deals for Rami Makhlouf, the billionaire nephew of Bashar al-Assad. A pharmaceutical company co-owned by Mudal Khuri is also registered at the address used for Atiya Khoury’s residency bond application. We asked Khoury via e-mail why he used a Russian address for his application, and whether he ever lived at the address, but he did not respond. Between 2013 and 2017, when the program was suspended, Hungary handed out nearly 20,000 permanent residence permits for residency bond investors and their family members. While Chinese predominate, permits were also issued to 1265 Russians. Some of the Russian buyers were members of Russia’s ruling elite, including the son of the Russian foreign intelligence. According to the Hungarian Immigration Office, 384 Russian citizens bought residency bonds through the program. As the family members of investors could also apply for residence permit, a total of 1265 Russian citizens received Hungarian papers in the program. VolDan, the company which sold residency permits in Russia and for Russian citizens, charged a fee of 60 thousand euros per investor, which resulted in over 23 million euros of income for the company just from Russian investors. We asked VolDan how much income they received for handling the applications of non-Russian investors, such as Khoury’s family, but the company did not reply.